Not to long ago I asked some people in one of my Facebook groups to send me feathers so that I can continue to tie flies. As you probably know by now, I live off a veterans disability and I cannot afford to by the supplies I need to continue this past time that really helps me to take my mind off of the anxiety, stress and depression that I would otherwise face if I didn’t stay busy doing something so enjoyable to me. Not only couldn’t I afford the beautifully colored feathers, but they generally come on the hide of the bird. I have read about how some exotic birds are now extinct because they were killed for their feathers; not neccessarily for fly tyers, but mostly hat makers. I don’t want to be a part of killing birds for flies when birds shed plenty to share without dying. I’m by no means a vegetarian; but I was taught since childhood not to kill something unless it is for food. People of the group came through for me. I received tons of feathers from people across the United States. One lady sent me a huge envelope full of feathers from her 12 parrots. As you can tell by my profile picture, some salmon flies take many feathers to create. Other flies although, such the one I created in this post, only use a small amount of feathers at the collar and tail. The rest of the fly can be made from thread, floss and litteraly thousands of other kinds of materials. The lady that gave me all of those feathers sent me a message today asking me if I’d do her a favor. She wanted me to make her a fly. I told her that after what she did for me, I’d send her as many as she wanted. She replied that she only wanted one. She wants to give it to a friend that is a veteran and about to turn 75. She sent me a video of him dancing around in a diner. I could tell why she loved him so much. He looked like a fun guy to hang around with. I asked if she wanted one to fish with or just something artistic, and she said it was just to put on his hat. That made sparks go off in my head. In a prior post titled “Thank You!” I told you how much I appreciate Project Healing Waters Fly Fishing #PHWFF for introducing me to fly fishing and tying. It truly is a therapeautic past time for me and many other disabled vets. I told you in that post that I created a web address called fliesforlife.com; which at the moment is just directed to this blog. When I get the page going I eventually want it to be a non-profit fly and tackle shop. By making flies, building and repairing rods, etc. it will give me a chance to give back to project healing waters and to other charities. It’s a circle I guess. I go to war and become disabled. Organizations like Healing Waters show there appreciation the best way they know how. Then I in turn want to show them that they are appreciated. I wish everyone would get into a repetative circle like that. Maybe we’d all get along better. Anyway what has kept me from starting this web site is an idea of something that I could do that was different. I wanted to create something that wouldn’t cost a bunch, yet start to earn money to donate to the organization. Thanks to this woman’s request I came up with that idea. This is the first one. It needs improvement; but I made a fly with a pin attached to the back designed to look like his Vietnam Service Ribbon. 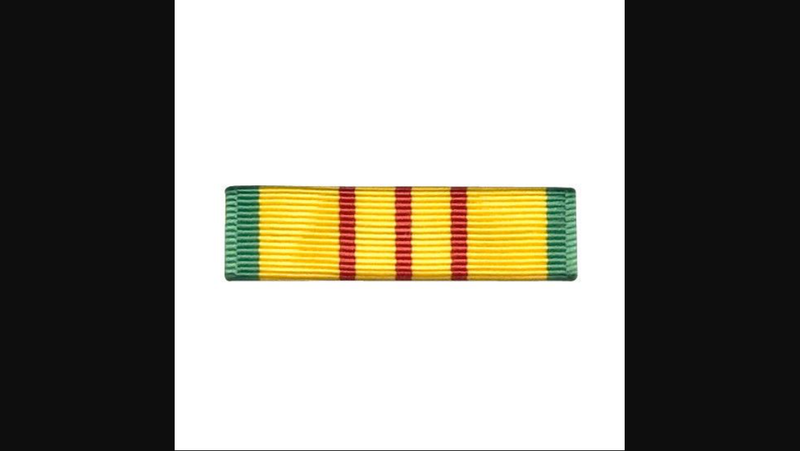 I figured that I could create ones for all types of service ribbons and combat awards etc. They would be inexpensive to make and I believe they would sell. Compare the Vietnam ribbon in the top photo to the ones of the “fly” hat pin that I made below. What do you think? Next Next post: Can’t Always be Healing. I was up all night after I got home from group last night. That’s awesome! When my son was graduating from Paris island, I created a ribbon pin in his company colors for the family to wear in the stands so he could pick us out. I shared it with the parents support group and quickly got HUNDREDS of requests. I made and mailed out thousands of Fox company ribbons and an entire section of the bleachers was full of red and yellow ribbons. My son couldn’t pick us out, but saw the huge amount of support and pride, all because I made a few ribbons. You have a great talent. Thank you for sharing it with the rest of us! My son was golf company 2nd battalion. He did six years in and is using his college money now. Healing on the Fly ﻿How Can I Help?